These are fun and super easy for your kids to makeover during summer vacations. These are popular during easter and to treat my little one have tried with both dark and white chocolates. Lightly grease muffin tin (12 containers) with olive oil and set aside. Break chocolate slab to small pieces. In a medium microwave safe bowl place the chocolate pieces and peanut butter. Heat on high until the chocolate has melted. Stop after 45 seconds, stir and heat another 15-30 seconds if needed. Be sure the chocolate and peanut butter are blended together. Once chocolate is melted stir in noodles until completely coated. Drop by spoonful into greased muffin tins and press in the centre slightly with the back of the spoon. (or you can even drop onto waxed paper and shape the “nests” using spoon/hand. 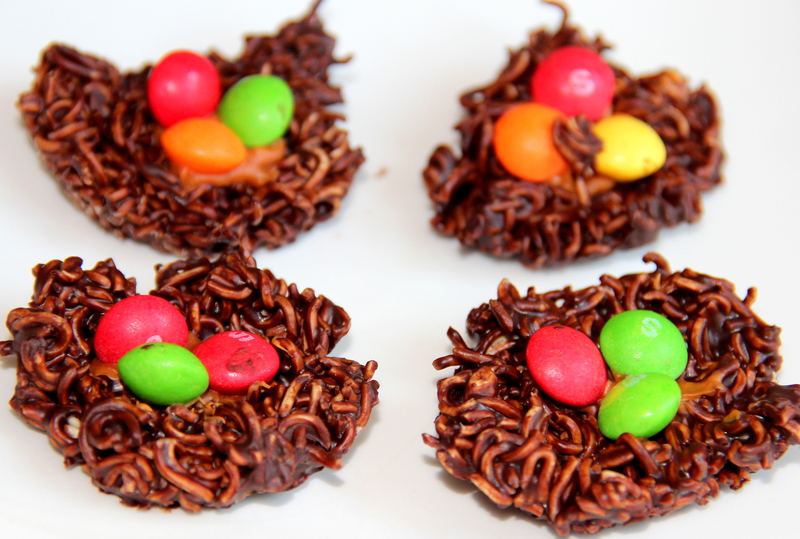 Place mini eggs or treats of your choice in each nests. 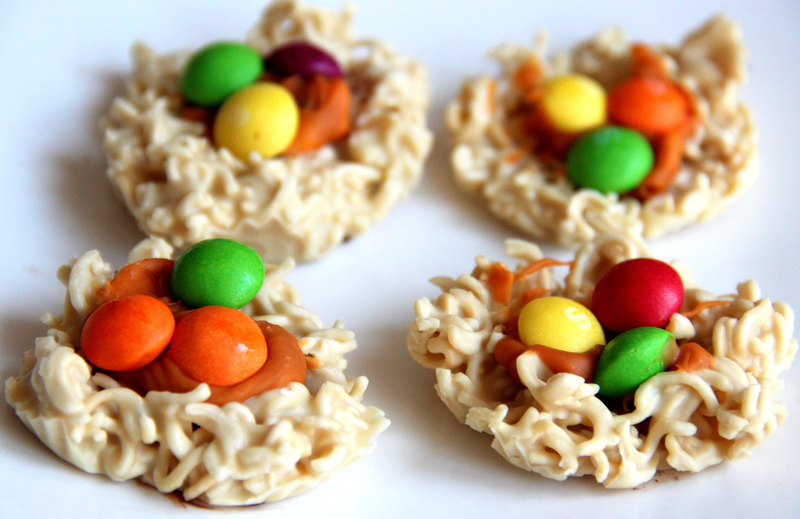 Posted on August 1, 2014, in Dessert, International, Kids recipes and tagged Chitras healthy kitchen, drchdietfood, Easter nest eggs recipes, Kids treat recipes, Noodles and chocolate recipe. Bookmark the permalink. 44 Comments. Thanks a bunch dear…..have a lovely day…. How adorable Chitra, I am going to make those for Easter next year. They would be perfect for a birthday party too. So clever. Suzanne – I came late to easter party 🙂 But tried this for my little one for school vacation to keep her occupied.. Thanks Chloe…Nice to know and chow mein noodles added extra crunchiness. Noodles used in recipe are boiled?? ?